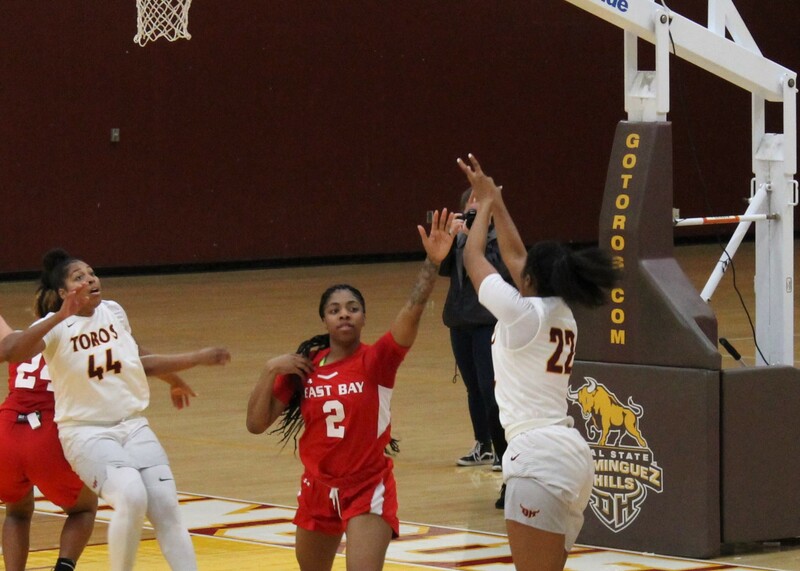 The CSUDH men’s and women’s basketball teams suffered close defeats to Cal State East Bay Saturday at home Saturday, the men losing a last-second heartbreaker, 74-72, and the women losing a half-time lead to fall 62-58. It was a tale of two halves for the women’s team, which led by eight at halftime only to falter in the final minutes. The Toros led by as much as 11 in the third quarter and had led the entire game after a 2-2 start, but an 8-1 Pioneers run over two minutes midway through the third quarter put them in a six-point hole. A 3-pointer by Tylore Belle ended the skid, and layups by Destinee Williams, and Bell punctuated by an Ahlisha Henderson free throw knotted the score at 56 with 1:19 remaining. But the Toros missed their next four shots to trail by four, and even though a Henderson layup cut the margin to two with seven seconds left, the Toros didn’t touch the ball again. The first half was all defense, as the Toros rotated fluidly and converged quickly in the paint to contest any would-be layup. Forced to settle for outside shots, the Pioneers couldn’t’ convert, shooting only 29.7 percent in the half. However, that was better than the Toros, who shot 28.7 the first 20 minutes. But the Toros hit 10-14 free throws, helping to account for the eight-point halftime lead. In the second half, the Pioneers heated up from the floor, while the Toros continued to struggle. Cal State East Bay hit 16-34 field goals, for a 47 percent clip, while the Toros made only 9-32, good for 28.1 percent. Midway through the third quarter, the Toros seemed to tire while the Pioneers aggressively attacked in the paint. With more attention needed inside for the Toro defense, the Pioneers shooters were free on the outside, and they began draining baskets. Although no Pioneer player had more than eight points, 10 scored points, and the Pioneers also had 14 fast break points to the Toros zero, compensation for CSUDH’s big edge in rebounds, 56 to 41. Henderson had a monster game, scoring 20 points and grabbing 14 rebounds in 28 moments. Inconsistent from outside, the Toros relied big on their 6-foot 3-inch senior center, feeding her the ball inside, as she wreaked havoc on the defensive end. Bell also had a strong game, with 14 points off the bench along with five boards. Up next, the Toros play Thursday at UC San Diego. Expect some fireworks, as the Tritons beat CSUDH 89-73 Jan. 5. The 74-72 loss was as close as the score would indicate. The atmosphere was intense between the two teams, both in the thick of playoff contention in the California College Athletic Association. With the win, Cal State East Bay moved into first place (13-4 in CCAA; 18-5 overall), while the Toros are now in a tie for sixth place (9-7; 11-10). The top eight teams advance to the playoffs. The Toros, who lost to the Pioneers by 13 in November, kept this one much closer. While the Pioneers appeared to display more athleticism and depth, the Toros matched it with more strategy and sheer tenacity, particularly among the starting five, all of whom played at least 32 minutes. They jumped off to an early lead, leading by seven at the 14:12 mark of the first half. But inconsistent shooting (for the game, they shot 35.8 percent from the floor and 28.5 percent from 3-point range) caught up to the Toros, who trailed by seven at halftime. But after the Pioneers stretched the lead to 10 four minutes into the third quarter, the Toros came roaring back. Two baskets in the paint, two defensive stops and a 3-pointer from Colton Kresel made it a three-point game. The game was tight from then on. With about five minutes remaining, it was tied at 63, setting the stage for an intense and physical stretch run. With the score tied at 72, the Pioneers had possession with about 15 seconds remaining. They ran the clock down and a jump shot by senior guard Juwan Anderson went in, leaving the Toros with two seconds and no time outs to stage a miracle. But the last-second desperation heave didn’t hit the rim. Still, they showed they can play the top team in the conference for 40 minutes and individually the starters all had strong games. Mikey Hatfield led the team with 22 points, while Wonder Smith had 19 along with seven rebounds and Alex Garcia contributed 13. For the Pioneers, who shot a blistering d 52.3 percent from the floor and 43.8 percent from beyond the arc, Even Wardlow led with 20 points. The Pioneers bench contributed 22 points compared to the Toros’ 2. Up next, the Toros face UC San Diego on the road Thursday. And don’t think they won’t be motivated. In January, they were blown out by 30 by the second-place Tritons, their biggest loss in conference all season.